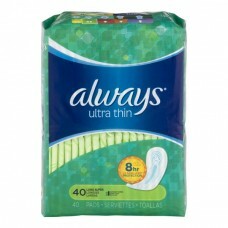 Always® Ultra Thin Long Super Pads. Up to 8hr LeakGuard™ protection. Without wings. Try Always Infinity™ with FlexFoam™. Absorbs 10x Its Weight™. More coverage = more protection. Up to 8hr. - 10hr. LeakGuard protection: Regular. Long super. Extra heavy day. Up to 10hr. LeakGuard protection: Overnight. Extra heavy overnight. For everyday in between, try Always liners. Always guarantee: 1-800-398-3766. Satisfaction guaranteed or your money back. If not satisfied with the performance of Always, send original receipt and UPC within 60 days of purchase for a refund. Limited to one redemption per household or name; no organizations. Refund is only for the cost of one bag of pads plus postage. Allow 6-8 weeks for refund. Call 1-800-398-3766 for details. Questions? Comments? Call toll-free: 1-800-888-3115. When making inquiries, please refer to the number printed on the bottom of the package. For more information visit always.com. www.pg.com. ©2014 P&G.